I admit it, I have voicemail phobia and I’ve had it forever. I absolutely hate leaving people voicemails. I hear the answering machine start and I instantly hang up. It’s now an instant reaction. Unfortunately, that also means the second I hang up, I think “darn, I should have left a voicemail.” Then, I’m faced with the awful dilema of, do I call them back (so they have 2 missed calls) just to leave a message, or do I wait until they call back on their own, or just wait until a later time to call back? I’m working on my fear, though. I’ve figured out that if I think before I even dial, I can leave a voicemail. I have to think about what will happen if they don’t pick up the phone, what will I say after the dreaded voicemail beep? The funny thing is, I have zero problem with checking my own voicemail. Well, I should rephrase that. 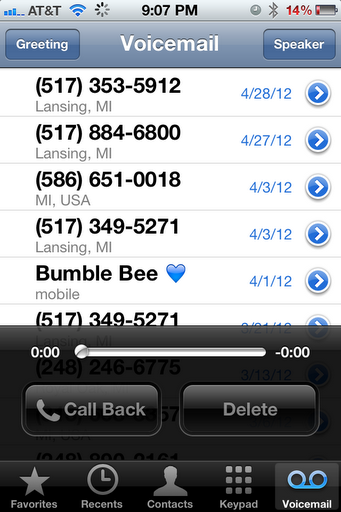 I have zero problem checking my own voicemail now that I have visual voicemail on my iPhone. I’m also a packrat when it comes to voicemails. I guess I need to clean it out! I used to absolutely despise dialing my voicemail and having to listen to all the different messages before I could get to the actual voicemails. Sidenote: I have to check voicemails and take messages as part of my job during the school year… I feel like I listen to 5 minutes of automated messages before any actual messages. I hate it! Confession time. I used to only check my voicemail to get rid of the silly little icon at the top of my screen! It would drive me nuts enough to endure the automated stuff to listen to the voicemail! I will conquer my voicemail phobia, one phone call at a time! Does anyone else have voicemail fears? I have a dumb phone and so it take around ten minutes to check my voicemail. I usually wait a week to listen to them!